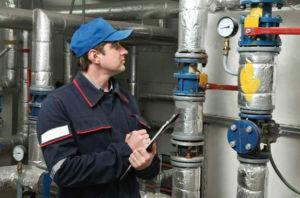 The most common boiler valve problems occur when valves are not maintained and inspected regularly and correctly; valves get damaged or broken most often due to corrosion, wear, and contamination. Regular maintenance helps prevent this. Now let’s take a further look at what leads to these problems. For these purposes, maintenance can be de ned as cleaning, replacing, remachining, general repair, and inspection. When this is not done correctly or often enough, the valve’s relieving capacity can be affected. Operationally, leakage can occur, as well as simmering, causing burning. This then leads to other frequent problems, such as rust—a result of leakage. In fact, a leaking valve is frequently the cause of the other problems. When a valve leaks, lost water or steam will be compensated from outside moisture. This moisture will often contain impurities/contaminates, leading to failure, and will cause higher or improper metal temperatures, leading to burning, as well as to overall failure. Mishandling or improper reassembly can lead to deformity of a part, in which case, bending might be seen. If boilers and their parts aren’t checked often enough, the boiler can run too hot, which can again lead to valve burning. Furthermore, inspection/maintenance must include proper insulation of supply or return lines, especially in cold environments. Without this, freezing is possible. Oftentimes, a valve is only as good as its original design. Poor workmanship, ranging from improper preparation of seating surfaces to inadequate welding and incorrect assembly can and often will lead to leakage, again a cause of overall failure. Valves must also be thoroughly tested by both the manufacturer and anyone performing repairs. Correct inspection and maintenance of your boiler valves means a) a high quality valve will live up to its potential and remain high quality, and b) de ciencies or poor workmanship will be caught, and valves can be repaired or replaced with effective ones.